A game, or problem solving? If h is for hack, then g is for go! In an attempt to try and even the gap between human players and strong chess engines, chess.com organised a time handicap match between Komodo and GM Sergey Erenburg. If you click on the link you will see that the odds were quite large (90m+30s against 3m+1s, small opening book, Erenburg white in all games) and yet the final results was 3.5-0.5 in favour of Komodo. For anyone who has developed their own chess engine, this should not come as a surprise. Even as far back as 1995 it was clear that chess engines were able to play quite strongly with very little thinking time. I observed this myself when we used to hold the Carbon v Silicon matches during the ANU Chess Festival. For the early part of the games, the human players would hold their own, but once time ran short, the engines would dominate. This is because engines can usually get to 7 or 8 ply in under a second, and it is in these first 3 or 4 moves where tactical blunders occur. So engines don't make them, but they do catch them, and this is enough to win. Even my poorly written chess engines (Vanilla chess and bchess) were able to solve over 80% of the positions in '1001 Brilliant Ways to Checkmate' with 1 second thinking time per position. So the match looks like a kind of 'confirmation' experiment, rather than a new approach to evening the odds. Based on the last few events at chess.com in this area, I still think that odds chess is the way to go, although even then, engines will have to start with less and less material as they get stonger. Last year I reported on the ACT Under 8 championship and this year was not any warmer. I'm pretty sure that the temperature didn't get above 8 degrees, and the situation wasn't helped by a lack of power in the hall (no heaters!). However, everyone seemed to have dressed warmer this year (forewarned is forearmed) and with my relaxed rules about running in the hall in play, everyone seemed to cope with the cold. The winner of the event was Lucas Leung on 6/7, just ahead of Oscar Ho on 5.5 There was a little bit of luck for the winner in his final game as his opponent missed a back rank mate which would have changed the final standings significantly. The best scoring Under 6 was Charles Huang who scored a creditable 4.5/7, and may turn out to be a future talent. As an arbiter is was pretty smooth sailing, although there is one issue that is becoming common in junior events. Every round there were one or two incidents of the DGT clocks 'mysteriously' resetting during the game. Both players would simply say 'it just happened', and claim they did nothing wrong. Having reset the clock and restarted the game, the fact that the next move involved someone slamming the clock pretty hard provided a simple explanation for what had gone wrong. For some reason this is occurring with greater frequency, so the next tournament may start with a lecture on proper clock etiquette. FIDE have announced that their online chess platform Arena, will now host matches between National teams. This is intended to allow teams prepare for the upcoming chess olympiad without requiring them to meet face to face. On the surface this seems like a good idea, although having gone over the regulations I'm not sure how many countries will actually take up the offer. While the regulations that that the matches are intended to 'simulate the conditions and the tension of an Olympiad round' they also do not require that an arbiter be present, or that the players of one team even have to play at the same venue. The matches are even exempt from Anti-Cheating monitoring, although the Federation is responsible for the 'sporting spirit' of its members. Of course nothing comes for free, and each player needs to be a paid up member of Arena. Well, if you aren't an IM/GM that is, as membership is free if you are. To me this is counter-intuitive, as the players and teams who would benefit from such matches are more likely to be non titled players from smaller federations, rather than titled players. Over all this doesn't seem too different from simply arranging a match between two groups of players on any other chess server (playchess, chess cube etc) except for the bureaucratic overhead of registering it with FIDE and stumping up membership costs for each player. So I'll be interested in seeing how many countries take advantage of this offer. The 2016 Gold Coast Open is being held this weekend, with the first round already run and done. By the time you read this it may be too late to book flights and accommodation, but you can still follow the event online. The top four boards from the top section are being shown here, and with three rounds tomorrow, you are pretty much guaranteed 12 straight hours of chess. One of the featured games tonight saw IM Brodie McClymont destroy Henry Slater-Jones Najdorf Sicilian. As with many games in this opening, Whites lead in development lead to a number of sacrifices. In fact McClymont had a couple of pieces en-pris at times, reminding me of the old adage "you can only capture one of them". Once Blacks's centre collapsed, McClymont brought up the heavy pieces, and that was all she wrote. 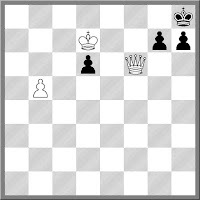 The shown position was from a game played last night at the ANU chess club. For most of the game the battle was more of a positional nature, with both players looking for outposts (c4 and c5) and fighting for control of the a file (which black eventually won). But this is a pathway to victory, not victory itself, and Black still had to find the winning move. It turns out that there isn't just one winning move, but a couple. Having watched the game this isn't that surprising, and confirms the adage "positional advantages lead to tactical opportunities". In the position Black played 1. ... Qe4+ which takes advantage of the placement of the white king and queen, as well as the fact that the bishop on g2 is attacked. After 2.Nxe4 dxe4+ 3.Kg4 (3.Qxe4 Bxe4 4.Kxe4 Rxg2) 3. ... Bd7+ 4.f5 exd3 White resigned. As for the other choice, 1. ... Bxd5 was the move I was looking at, with 2.Bxd5 (and not 2. Qxd5 Qe2#) 2. ... Rd2 causing White all sorts of problems. But Black sensibly chose the clearest way to finish the game. The 24th ANU Open is taking place in Canberra on the weekend of the 30th and 31st of July. The venue is the ANU School of Art, Childers Street, Acton, a 10 minute walk from Canberra City. First prize in the Open is $1000 with a $400 first prize in the Under 1600 event. If you are from interstate and thinking of playing, University House (the venue for the O2C Doeberl Cup) is a good choice for accommodation, while there are plenty of other places to stay within walking distance of the venue. The ANU Open is part of the 2016 ANU Chess Festival which has a number of other chess activities (team blitz, schools teams tournament) from the 29th of July to the 3rd of August. I've just stumbled across a game/concept called Moveless chess. The idea is that you defeat your opponent, not by moving pieces, but by transforming them. You are given a position, and a number of 'points' which can be used to turn one type of piece into another. The points match the standard value of chess pieces (Q=9, R=5 etc) and each transformation reduces the number of points you have. The idea is to checkmate your opponent by transforming your existing pieces. In the meantime your opponent can move, so it isn't as simple as it looks. I've had a quick play with it, and even at the simplest level it took a couple of tries to solve the position. I'm sure with practice I can do better (like most things). It looks like a pleasant alternative to traditional chess problems, although the solving technique of 'I wish I had a queen instead of a knight here' doesn't neccesarily translate to real world chess. Which rooks should go on which files is a fundamental question in chess. The dreaded 'wrong rook' syndrome plagues chess players, and the correct answer often depends upon the outcome of the game. But this post isn't about that. It is about which rook should be captured, if you have the choice. Due to my extremely risky play in a Street Chess game on the weekend, I gave my opponent exactly this choice. He could either capture on the kingside, although I would be able to recapture straight away. Or he could grab the rook on a8 with impunity. In the end he took the rook on a8, but this allowed the remaining rook to join the attack. I guess I was lucky that my opponent chose the wrong rook. A strange game between Hikaru Nakamura and Magnus Carlsen in the current Grand Chess Tour event being held in Belgium. Nakamura was having a terrible day ( 3 losses) but was then gifted a piece by Carlsen due to what seems to be a simple miscalculation. 11. ... Nxd5?? 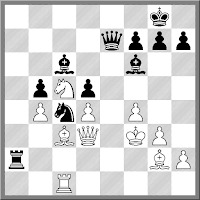 is just a blunder, and if Black wants the pawn on d5 11. ... Bxc3 has to be played first. White is still a little better (pressure against g7) but not a piece better. At the club level, knowledge of endgame 'fortresses' is a bit hit and miss. It is kind of like knowing how to mate with Knight and Bishop, in that the more you study it, the less likely it is to happen. To be fair, real examples of a position similar to the one given here are quite hard to find. I suspect this is because at the club level players don't know enough to go looking for them, while at the IM/GM level, both players do know enough, and therefore avoid them if they can. However, this position did come from a real game, and there are a couple of lessons to be learned from it. Firstly, it came from a position where Black had forced White to play Ne2xf4 as there was a pawn on f4 threatening to win the knight with f3+. In doing so, Black had unwittingly given White more drawing chances than if the knight was left on the board for a bit longer. Secondly, White still has to find Kf1 here to hold the draw, which he did. Thirdly, once this happens, the only thing White has to watch for is the sequence Qxe3 fxe3 Kxe3 with the White king on the wrong square (eg e1). For around 15 moves White seemed to have it all under control, until his concentration slipped. With the Black king on f4 and the rook attacked by the queen, White played Ke1 and quick as a flash Qxe3 hit the board. Realising it had all just gone wrong at this point, White gave his opponent a sheepish grin and resigned. This Saturday (18th June), Street Chess will be holding a fundraiser for Alana Chibnall, who has been selected to represent Australia at the 2016 Commonwealth Championship. The Commonwealth Championship is being held in Sri Lanka from the 30th July to the 7th August, and Alana is playing in the Women's section. All entry fees from this weeks Street Chess (plus any additional donations made) will help cover Alana's travel costs to the tournament. As someone who has supported Street Chess over the last decade (both as a regular player and arbiter) it is the least the STreet Chess community can do to help her. Street Chess runs from 11am to 3pm every Saturday in Canberra City. The venue is King O'Malleys in City Walk, with this weeks event being held inside (go through the City Arcade entrance). Entry fee is $5 ($1 for Under 16) and there is a prize pool of $100, provided by sponsors King O'Malley's and Chicken Gourmet. The format is 7 round swiss with a time limit of 15 minutes per player per game. GM Zong Yuan Zhao and and GM Max Illingworth have tied for first in the 2016 NSW Open. Zhao lead by half a point going into the final round, but a 3 move draw with IM Anton Smirnov (1.e4 e6 2.d4 d5 3.Nc3 =) allowed Illingworth to catch him with a win over IM Richard Jones. Zhao went through the event undefeated (taking a half point bye in round 5), while Illingworth lost to Smirnov in round 5. The short draw gave Smirnov a share of 3rd place, alongside IM Igor Bjelobrk, FM Kevin O'Chee and Donato Mallari who all scored 5.5. In the Minor Frank Low and Michael Gong tied for first with 6/7. Low had a quick win over Gordon Yank, while Michael Gong held off a strong attack from Lee Forace to grab his share of the top prize. The results for the Open can be found here, with the Minor here. From an arbiters point of view the event ran well, although with an increase in the number of players (144 this year) there was always going to be a few issues to deal with. However these were dealt with sensibly (by players and officials) and hopefully every found the event pleasant and enjoyable. While the main interest in the 2016 NSW Open comes from the 'Masters Room' (where the DGT boards are located), there has been some interesting chess from the main playing hall as well. Frank Low went into the final round trailing the Under 1600 tournament leader Gordon Yang by half a point, and then this happened. At the time of posting this there are some games still in progress, but due to this slashing win, Frank has a least a share of first, and is waiting to see who joins him. Keeping with my theme of miniatures from the 2016 NSW Open, here is a quick game from round 5. The game ends with a nice queen sacrifice on h2, with the bishop on b7 playing a key role. In fact this tactic isn't that uncomment, as I recall seeing a number of games from the 1970's that were almost identical to this one. It is an idea worth remembering, especially if you are going to play the Queens Indian/Nimzo Indian hybrid against d4. One of the more striking games from Round 4 of the 2016 NSW Open was played by IM Anton Smirnov. An over ambitious pawn advance by hos opponent allowed the centre to be opened in Smirnov's favour, and after that it was just a swam of pieces invading White's position. Black even had the luxury of offering his queen, and although the sacrifice was not accepted, this just allowed one more piece to joint the attack! A few players have taken the tactical bye in round 3 (rather than round 5), but for the rest the action in the 2016 NSW Open started early. Not as early as it should have, mind you, as the club was late in opening, but AM starts for rounds are always tough. One player who seemed to have little difficulties with the early start was IM Igor Bjelobrk who had a nice win over FM Kevin O'Chee. He got his g pawn running early, although the kingside hack that normally occurs with it did not eventuate. Instead he just got a better position in the centre enabling a nice tactical finish. Bjelobrk is now on 3/3, although he is likely to be joined by others once the round is complete. The 2016 NSW Open got off to a very good start, with a field of 144 players stretching the venue capacity to the limit. Two GM's and 4 IM's signed up for the tough 7 round Open schedule, in a field of 77 players. At this stage of the event there are still 14 players on 2/2, so a clear leader is not likely to emerge until the end of tomorrows action. The Minor (Under 1600) has attracted a 67 player field, and unlike the Open, rating seems to count for a lot less. Like the Open, there are also 14 players on 2/2, but in this event only 3 of the top 10 rated players are in this group. Tomorrows round starts at 9:30, with a brutal 3 rounds being played. You can follow the top 6 games from the open at http://nswopen.nswca.org.au/live/livegames.php (as well as see IM Andrew Brown's nice win in this afternoons game), while you can click on these links for the Open results, and the Minor Results. Round 1 of the 2016 NSW Open has just finished, and although there were a few upsets, most games went according to ratings. The top seeds all collected their expected points, and most of these games were over fairly quickly. Newly minted GM Max Illingworth had the shortest win, over Stephen Ireland. However the victory may have less to do with GM technique and more to do with an over ambitious opening strategy by White. Although the king is a strong piece in the ending, and can sometimes hold its own in the middlegame, straying too far from safety in the opening can be disastrous. With the king quickly ending up on e3 Max had a choice of strong finishes, settling on g5, when White decided he had played enough moves. Second round is underway, and you can follow all the action on the links given in the previous post. The 2016 NSW Open has begun with a very large field of 145 players across both sections. Top seed is GM Zong Yuan Zhao, with GM Max Illingwort, IM Anton Smirnov, IM Richard Jones, IM Igor Bjelobrk and IM Andrew Brown, contributing to the strength of the field. If you wish to follow the tournament online you can see live coverage here (http://nswopen.nswca.org.au/live/livegames.php) and keep up with results at chess-results.com for the Open and Minor. A nice story from Singapore about an after work chess club which has succeeded in bringing more players into the game. The organiser is Bradley Loh, who is well known on the Sydney chess circuit, having been an active tournament player before moving to Singapore 2 years ago. While not quite the same as say Street Chess in Canberra (which is competition focussed), it seems to fulfil a similar need, providing a casual place to drop into if the mood takes you. As the article states, this also helps introduce new players to the game, in a less competitive manner, and bring lapsed players back into the fold. The 2016 Grand Chess Tour begins this evening in Paris. The format of the series has changed from previous years, introducing 2 Rapidplay/Blitz events to make up for the loss of the Norway Chess Classic. The first of these events runs over the next 4 days, with a Rapidplay RR, followed by a Blitz Double RR. The lineup is obviously strong, with Magnus Carlsen (as an invited wildcard player) heading the list. The event broadcast begins at 10pm Canberra time (according to the countdown timer) and all the details can be found here. Word has just come through that Viktor Korchnoi has passed away at the age of 85. He had a career spanning almost 80 years, including a spectacular run from 1968 to 1983 where he played 2 World Championships matches, 2 candidates finals (one of which was a de-facto World Championship match), and 2 Candidates Semi-Finals. His major success came after the age of 40 and he was an active GM well into his 80's. I never had the chance to meet Korchnoi directly although I did once share a dinner table with him. At the 2006 Olympiad in Turin he happened to be aitting at the same table as members of the PNG team (due to a shortage of space), although I assume that he did not know who we were. It turns out that one of the PNG team had no idea who he was either, having struck up a conversation with Petra Leeuwerik (his wife). After some initial chit chat the following question was asked 'Are you here for the chess?' Fortunately for the player concerned Petra just looked at him and shook her head, rather than passing the question on to her husband. Otherwise a display of Korchnoi's legendary temper may have suddenly occurred. Probably the best player never to be World Champion, the legend of Korchnoi will live long in the memories of chess players. I'm not sure if this counts as another shoe dropping in regards to this previous story, but FIDE President Kirsan Ilyumzhinov has had his named linked to activities connected with the Panama law firm Mossack Fonesca, of the 'Panama Papers' fame. Certainly the issue of what Global Chess actually does apart from hand out money, and who actually owns the company, has been discussed in the past. Even people I know in FIDE aren't all that clear on what the arrangements are, but at the same time seem happy not to find out either. The attitude seems to be that as long as the money gets spent on chess (in some way or other) then where it came from does not really matter. The diagrammed position came from a game at Street Chess today. With white to move it looks easy and straightforward. Two mate in 1's, how hard could it be? But for those kibitzing the game it turned out to be a lot harder, in a couple of ways. The first clue that something was amiss was that White was doing a lot of thinking. Then it was observed that all the captured black pieces seemed to be on the wrong side of the board. It slowly dawned on the spectators (those that came late anyway) that they were looking at the board the wrong way round. In fact Black is going *up* the board, with the King on h1 (not h8!). Suddenly the best move for White isn't so obvious, made all the more difficult by the unnatural location of the pawns. With best play it turns out that the game is a draw. Black has to break the pin with Kg1 and White has nothing better to check the king back into the corner and keep the queen on f3. 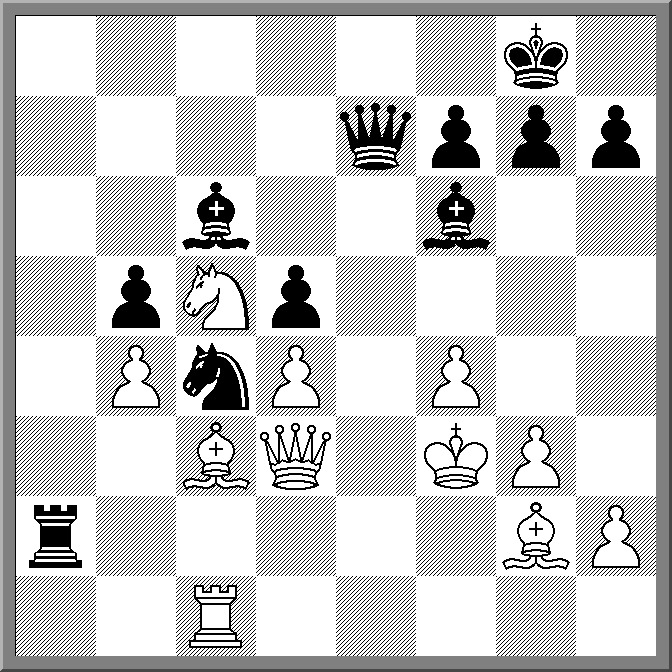 However White tried the practical Ke1 and Black chose the obvious, but fatal d2+. After Kf2 it was all over. Black did get hist queen with d1(Q) but Qxg2 was the instant reply, ending the game. Under-promoting to a knight (with check) is appealing but Kg3 is good enough (but not Kf1 which is of course illegal). The post mortem was just as fun as there were a number of illegal moves suggested, and legal ones overlooked. BTW the drawing line after Ke1 was Kg1! as Qf2+ Kh1 forces Qf3 (not Qf1 gxf1!) and then Kg1 is a repetition. Heavy rain is predicted for Canberra over this weekend. As it is the first Saturday of winter, this won't affect Street Chess as much s normal, as winter sees less of Street Chess and more of 'Arcade Chess'. As we have done for a number of years, Street Chess moves indoors for the winter months. Eighteen months ago I had what might be best termed as a 'change in my employment status'. This allowed me to spend a year drinking coffee, riding my bike and playing some chess (interspersed with some freelancing, tournament organising, and writing job applications). After a year of doing that I moved into the area of cyber security (a very trendy field in Australia at the moment). Now all the usual attributes and abilities you develop as a chess player can probably be applied to IT security. You need to anticipate threats, plan ahead, and most importantly, keep up with current theory. I'm not sure *I* bring all those attributes to the field, but chess metaphors to apply. At least one person has made a more direct link however, matching roles in the security fields with the roles that pieces have on the board. Chris Conacher believes that chess provides good lessons for companies and people working in the field. At a subsequent conference participants were even polled about what chess piece they would like to be, and this provided some interesting answers. If you a chess player working in IT it makes a good read, especially if IT security is a foreign field. Who knows, you may end up like me, falling unexpectedly into the field, and so like in chess, a bit of pre game preparation can't hurt. 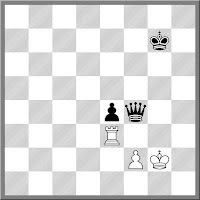 The day a new chess player discovers en-passant is often a very significant day indeed. This new 'sneaky' move suddenly becomes a go to weapon, setting the player apart from their peers. However it can be overused, especially if the rule is only half understood. As a junior tournament arbiter 'Can I capture en-passant?' is one of the most common questions I get asked. Players will try and capture en-pas pawns in front of other pawns, pawns that have moved only one square, or just at some random moment in the game. Worse still, some will try and capture their opponents pieces 'en-pas' or try and capture pawns with their pieces in a similar manner. However there is one situation where experienced players sometimes get a little confused, mainly because it is quite rare. It is where a pawn has advanced to the sixth rank, and then a pawn on the adjacent file pushes two squares ahead. On more than one occasion a player has looked at the board, looked at me and then started with 'Uh, can I uh, hang on, can I ...' I usually just smile and shake my head, or give a longer explanation if asked. 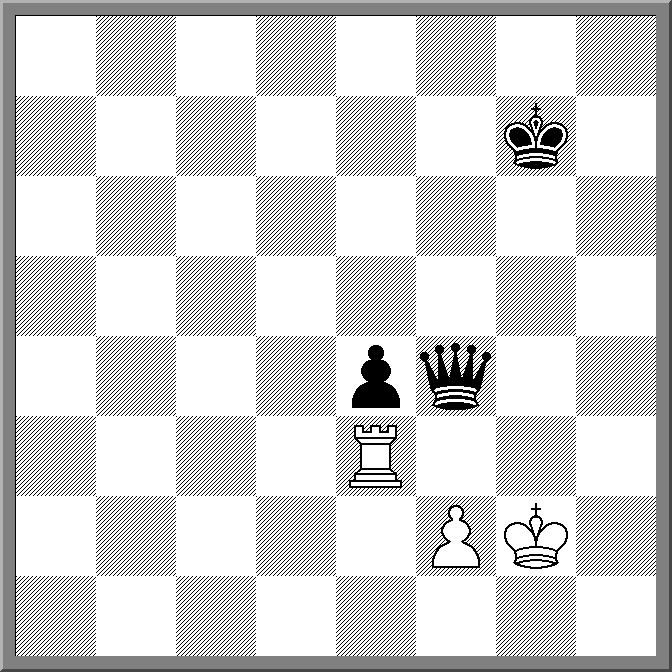 If you look at the game below you will see an example of this after whites 17th move. Of course both players in this game do know the rule, so the title question never came up. What did happen instead was that Caruana just demolished Radjabov in another 18 moves, and move to 4.5/5 in the Gashimov Memorial.